Basicly you can use all type of fonts either its from your computer or by downloading from the internet. Note: You can change fonts in your new or old BlackBerry type (OS4, OS5, OS6, and OS7). After you obtained the font you desire, you must change the font extension from .ttf to .font before you do this tutorial. Run Files application (in Homescreen or Application folder). Choose File Folders and go to Media Card. Select the font file that you want to add and click Menu button and select Cut. Click Back button, go to Device, and then click Menu button and select Show Hidden. Navigate to /Device/appdata/rim/fonts/ folder. And if the "fonts" folder does not exist, create a new folder with that name by clicking Menu button and select New Folder. Install the font by clicking the BlackBerry Menu and select Paste. Repeat the above steps if there are more fonts you want to install or add. After the BlackBerry restar, you can change BlackBerry font by going to menu: Options -> Device> Screen Display -> Font Family. - For OS5 and OS6, the maximum font size that can be used is 90KB. 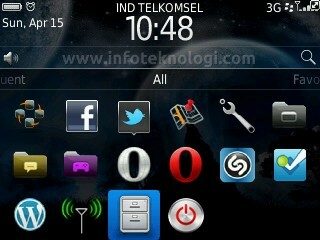 - All BlackBerry device font can be replaced (storm, Curve 8520, Gemini 3G, BlackBerry Bold (9700-9780), Onyx, Apollo, Torch, Dakota, etc). 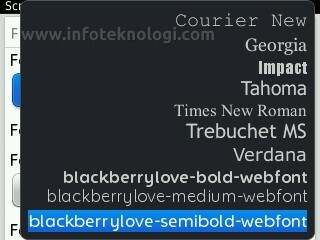 - This tutorial can be used to add any fonts, but sometimes it won't look good on your BlackBerry (too big, or too small).